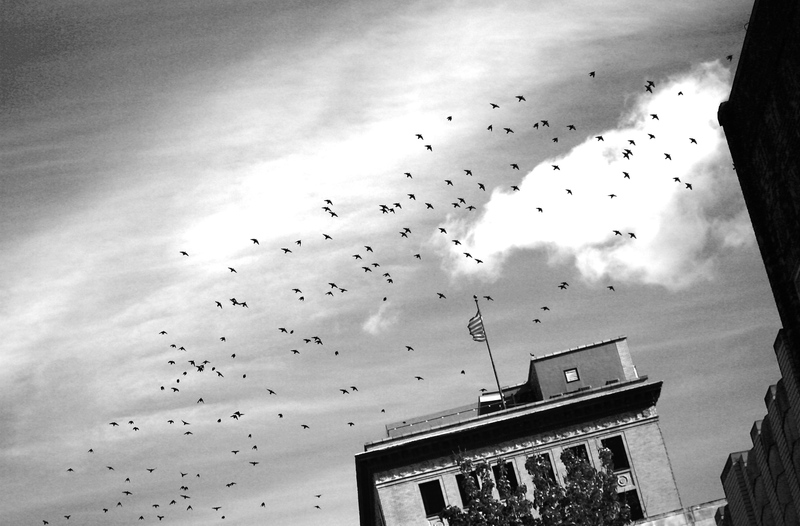 Today, while running an errand downtown, I saw a cloud of these small, black birds wrench up as one from the building where they’d perched. They whirled across Campbell Avenue, dipped and settled down on the opposite side of the street. I watched them leap the street again, spooling up into a cyclone, a thunderhead, a swell. In a moment, their shape shifted into something else entirely: something animal. Or perhaps something not animal at all. There is a phrase for this, this synergy, that we humans use: The whole is greater than the sum of its parts. It’s a cold, mathematical way of explaining something that resists all mathematical laws. Something very nearly supernatural. But here the birds were, expressing this concept in a way that felt more truthful. I have been on my own for a long time now, beating my wings in the dark. And now I can feel it, a kind of convergence coming. The birds whirl as one, and they become something other than birds. I want that, too. Tell me: how do the birds know, to gather and leap into empty air? When to dive? Turn south for the winter? I don’t know these things, but for now, the instinct inside me is enough. I lean forward into the steering wheel. I cannot hear the sound, but in my chest is the beating of wings. I press the lens to the glass. I hear the shutter open with a click. I wish words would come to me like they do to you, sigh. Words are my first language, so they come easy for me. But I am learning that there are other tongues — some of them better suited for what I want to say. Which wouldn’t mean a thing without a few good souls to listen & try to understand. But again I say, there are few that can play with just a small selection of words in a way that makes my soul jump with joy!